Spherical and monodisperse Co x Ni100 − x and Fe z [Co x Ni100 − x]1 − z particles are synthezied by the polyol process over a wide size range (lying from a few micrometers to a few tens of nanometers). The whole physico-chemical characterizations, i.e. dark-field image by TEM, SAED, density, saturation magnetization and chemical analysis, are consistent with a “core-shell” model. In the Co x Ni100 − x system, the particles are constituted by a ferromagnetic, almost pure and dense core surrounded by a thin coating composed of metal oxides and metallo-organic phases. On the contrary, in the Fe[Co x Ni100 − x]1 − z system, the ferromagnetic core is polycrystalline, slightly porous and retains impurities in higher content, the superficial layer having almost the same composition as in the Co-Ni system, but being twice more thick. The microwave permeability of the Co x Ni100 − x and Fe z [Co x Ni100 − x]1 − z particles, previously insulated by a superficial treatment and then mechanically compacted, is investigated in the 100 MHz-18 GHz frequency range. Whatever the composition, submicrometer-sized particles show several narrow resonance bands which are interpreted as non uniform exchange resonance modes. 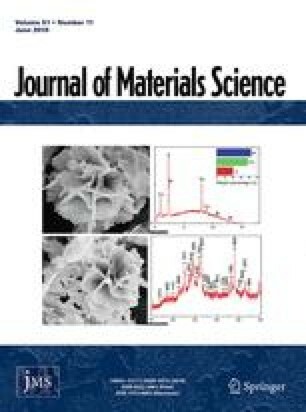 Iron-based particles have lower resonance frequencies than iron-free powders; they also have higher permeability levels despite their lower cristallinity and their higher impurity content. A mild thermal treatment allows to increase this permeability by eliminating the metallo-organic impurities without modifying the morphology of the particles.